After showing our ticket at the entrance we went inside the museum. This museum is not so big but a well maintained one. There is a garden in front of the museum were many of the ornate statues, excavated from various sites from Hampi are kept. 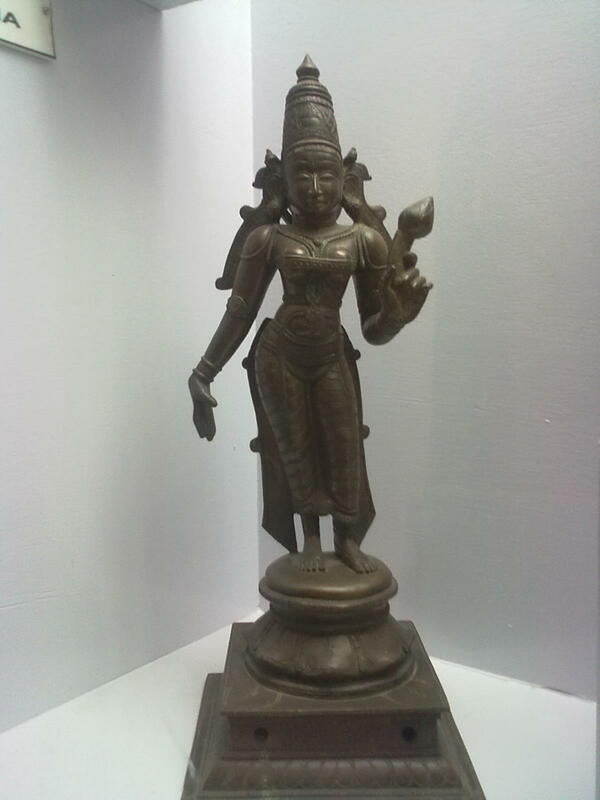 After seeing these statues, we went inside the museum, here the replicas of the bronze statues of Krishnavavarayar and his wives will welcome you. Original of these statues are in Tirumala Balaji Temple. Museum is divided in to four parts. I went in to the first room - which has the statues related to Shiva got during the excavations. All the four rooms are connected internally. Next room has statues related to Vishnu, after seeing the statues kept here we went in to the third one. 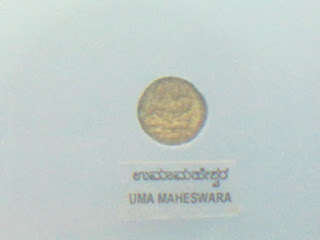 Here you can saw various coins of Vijayanagar era through magnifiers. Apart form that you can see old swords, iron pipe used as a part of the gun and various other things. In this room there is big board which explains the development of Kannada and Telugu alphabets - development of these scripts over a period of time. Last room has various items from pre-medieval, medieval periods. 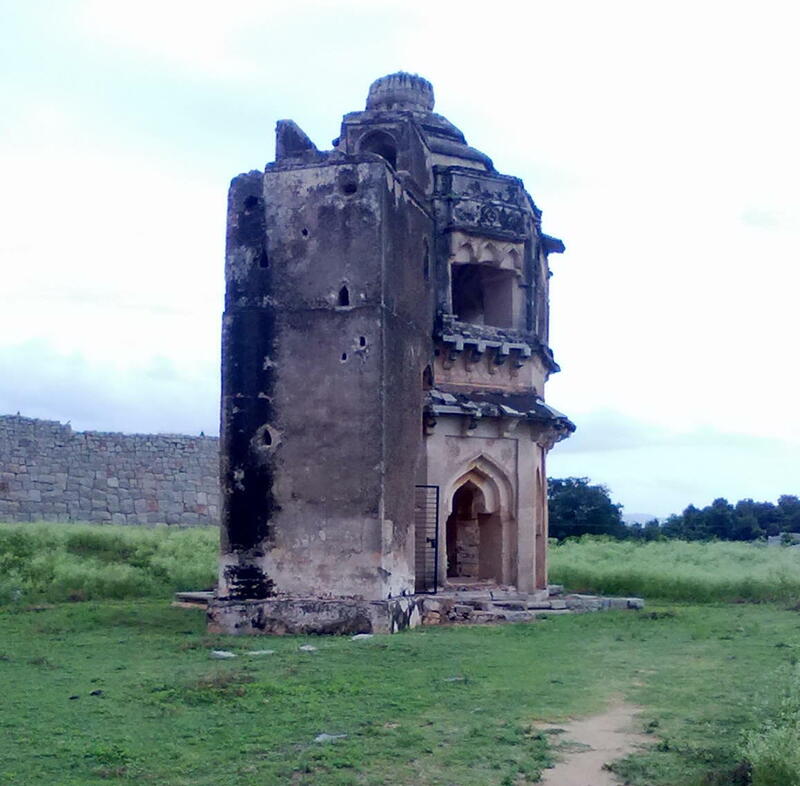 Here you can see the pictures of Hampi before and after exploration. If you are visiting Hampi this is one of the important location you shouldn't miss. After leaving museum we took lunch from the town and started moving towards Zanana enclosure. Because of the time shortage we left the Domed gate which is again on the museum road. This part of the road has a favourable gradient for cycling. Instead of taking the opening near to the Queens Palace, we selected the opening near to the Underground Shiva temple. After underground Shiva temple, we went to Mohammedan Watch tower, Bandstand and then to the Noble Quarters opposite to it. In the noble quarters there is nothing to saw other than the reconstructed foundations. Band stand and the associated tower is an example of what not to do by visitors in a historical place. Some wrote their names in the plaster using ink and some other using penetrating objects. Is this they way they want to remembered? Next was the Royal Treasury and Mint Area. There is noting much to see in this area other than some foundations. Finally we reached the entrance of Zanana Enclosure, here you have to show the ticket to enter. Inside Zanana enclosure, in anticlockwise direction, a small museum will come first - photography is prohibited in this area. After that you can saw the watch tower of this area, heavily guarded when the empire was functioning. Next in line was famous Elephant Stables of Hampi. This is a single story building with 11 stables built in Islamic Style. Vijayanagar architecture was famous for mixing Islamic Architecture with their own. Elephant stables, decorated with Islamic style domes not only reveals the splendor of a now forgotten empire but also its secular nature and desire to experiment with various ideas. Earlier these stables were connected and a not so easily visible door will took you to the top. Queen's palace is located in the middle of this - now only the foundation is there. 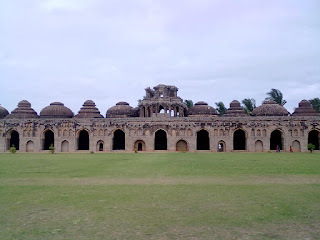 Another important building in this area is Lotus Mahal. As the name implies a carefully regulated water supply through the hallow pillars of the building regulated the heat in the earlier times. Now ASI stopped the process of water supply through these hollow pillars as it is affecting the structural stability of the mahal. This area also contains a number of Jain temples and Ranga temple. As it was close to evening, we left Zanana and decided for final look of Royal Enclosure. I just climbed the steps of Mahanavami Dibba and stand there for a long time, imagining about the old times of Vijayanagar when it controlled entire South India and having trade relations from Venice in the West to Myanmar, China in the East. Before leaving the area we decided to saw Hazararama Temple once again. As I told earlier, the story of Ramayana is described in the walls of the temple. We sat in the garden near to the temple and slowly started reading the epic pictured in these walls. 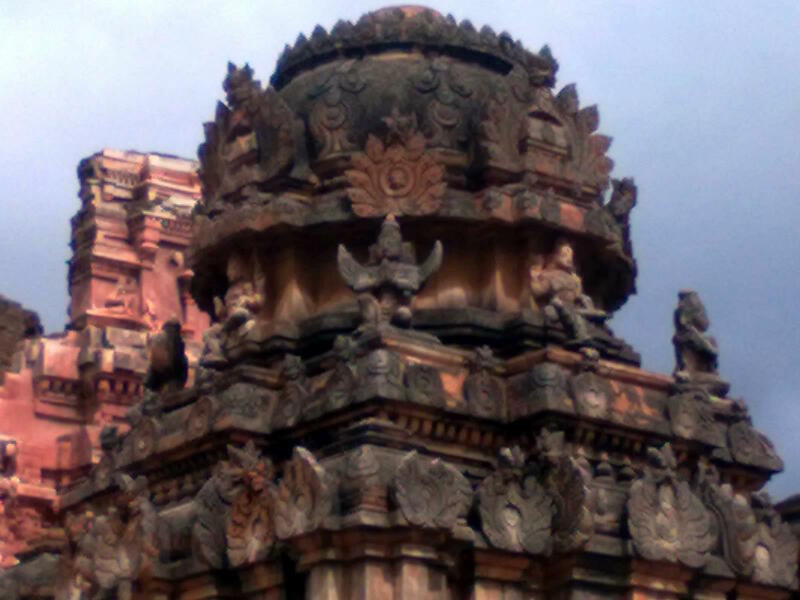 Hampi's Pan -Supari bazaar is located in the opposite side of Hazararama temple. Slowly with a heavy heart we cycled towards our room, near to Virupaksha Temple. As the time was close to evening and the KSRTC bus from Hampi to Hospet was at 8.30 pm we left quickly. Even though we reached the bus at 8pm, we were unable to catch the bus. Nearby shop owners told us that the bus left for Hampi already. We simply stood there wondering what to do for the next 30 minutes!!! As there wasn't any sign of the bus we finally decided for an auto, and a Tata Magic was already taking people. Thinking what would be the amount he was going to charge from Hampi to Hospet. Driver said it's equal to bus charge. To make it sure what I am heared is correct, I enquired again - 15? He replied "Yes" and finally we reached Hospet. But the journey was significantly more comfortable than many of the train journeys in General Compartment. 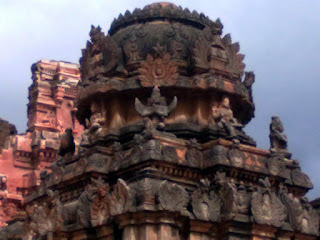 Throughout the journey I was thinking about Hampi and Vijayanagar. Just Imagine, once powerful empire - Vijayanagar - now exists in the public space because of its one famed capital - Hampi - only. A perfect example of the consequences of a devastating defeat, after which it completely erased to ground. 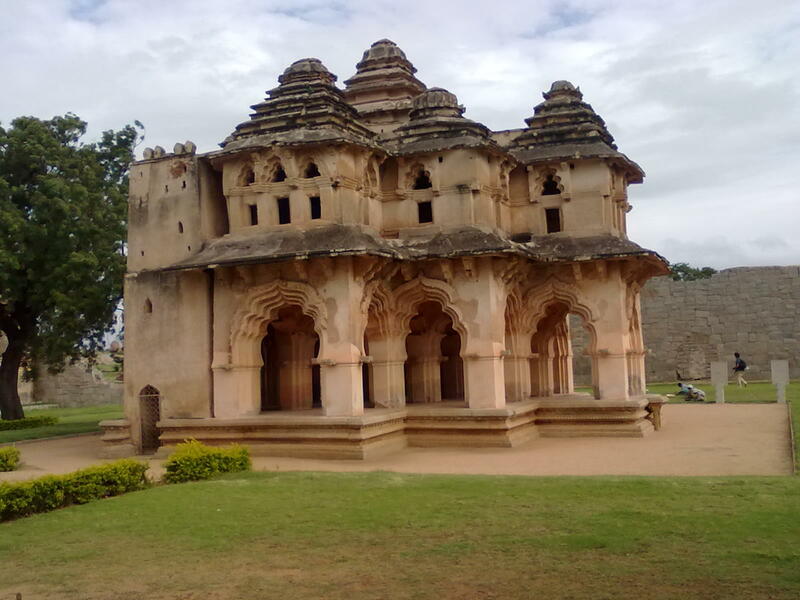 What we are seeing now in Hampi - apart from Virupaksha temple and a couple of other places - is the combination of old monuments got form the excavation and ASI's imagination of what it was during the time of empire. This was very much visible when you will see the striking differences in the before and after exploration pictures kept in the museum. Many of the stones used for restoration are fairly new ones and many of the old brick structures now protected by applying stone coverings over it. ASI is doing an appreciable work here in restoring these monuments, but how far we are cooperating? What will happen if everyone visiting the historical monuments are marking their own names in the protective plasters using ink and penetrating objects? 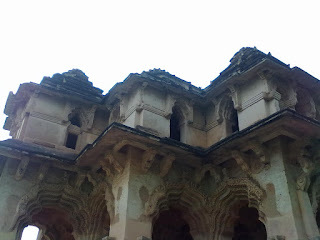 If you come to Hampi expecting a palace like that in Mysore, or a monument like that of Tajmahal etc, you may be disappointed. But if you are coming with an open mind after reading the past history of Vijayanagar - its trade, commerce, governance, Talikota war and its final destruction you will be overwhelmed by the experience. Finally we reached Hospet bus stand around 9.15 and went for a full dinner. As there was enough time, we decided to try local mangos and sweets. When the clock ticked 10pm we came back to the bus stand. With in no time I got a call from KSRTC saying that the bus we reserved is no more available - its cancelled!!! and asked us to contact Hospet traffic controller to get another bus. I went to him and told him about the situation, he repeated the same sentence and asked us to go in a 10.30 bus. I stood next to his table to make it sure that we would not miss the bus. As told he imformed me when the baus came. But when asked about reservation, there was no response. He told that the bus we reserved was cancelled, now go in the first available bus. After paying reservation fee, user fee, infrastructure fee along with 2.5% service charge seat is not assured if that bus was called due to some reason which have nothing to do with us. Someway we got two seats and hoping for the best sat there itself. After some minutes the bus started moving - finally we are going back. Going back? not exactly... Who knows with what face problems will come? Here it was in the form of Bus Conductor. He came to my seat, and I gave him the reservation ticket along with ID card. But he was not even ready to look in to the ticket. For all the things he has only one answer - he can't give us the permission to travel in that bus. We even told him that, hospet traffic controller himself told us to travel in this bus. Bit nothing made any changes. He told the driver to stop the bus, our arguments went on for some more time but without much effect. He asked us to go out and try another bus. Finally we are outside in the middle of nowhere, and yet to travel more close to 350km. If that bus - in which we came after getting permission from traffic controller was not allowing us to travel then there is little hope for any other KSRTC bus to accept us. Now only, two direct buses are left for Bangalore from Hospet in the night. So finally we took an auto to reach Hospet stand. I even tried to call KSRTC, to the same number from which I got the information regarding to the cancellation of the bus. First time they cut the call and in second time, after repeating that the bus was cancelled and we have take another bus they cut the call!!! Finally we again approached the Traffic controller, this time he was furious, blaming us for coming out of the bus. According to him he is the higher authority and whatever he says is valid. It is purely our fault, the argument went on for some time. People started gatering around us but it didn't cut the ice. Suddenly another traveler came forward and acted as an interpreter; one more KSRTC official who looks like a senior one came and started speaking in fluent English. He too started chewing the already chewed arguments like its our fault, whatever happened we should not come out of the earlier bus. Suddenly, he asked me - are you from Kerala? I said yes. Then he explained me that the problem is a communicational one and didn't forget to repeat the old arguments - fault was on our side and traffic controller is the higher authority so the conductor have to obey controller's order. I was not ready to buy his first argument, second argument was technically correct but we have to do with the authority of Traffic controller? It’s their problem. 2-3 kms down the line if they are stopping the bus and ticket conductor - strongly but politely - inform us that we can't travel in that bus what we are supposed to do? Anyway time was running out and now only two more bus are availble in that night. Finally another bus came, and traffic controller asked us to get in, but this time before entering itself I gave the ticket to conductor. As expected he said he don’t have any reservation in his bus so I had to bring the earlier mentioned traffic controller again. He explained the situation and finally we were in. Later that conductor went to the controller and took his signature in our ticket. By the time we finally started moving towards Bangalore, we almost lost the appitite to taste the mangos and sweets.